Benny Poteat is, among other things, a tower jockey, his life defined by up or down. Working hundreds of feet in the air repairing tension lines and replacing burned-out lightbulbs, he observes the world from above. Benny has seen a lot of things from this vantage point, but nothing can compare to watching a girl die. She approaches the river that snakes far below him, sets up a video camera, and walks purposefully into the rushing water, never to reappear. Startled at both what he’s witnessed and his inability to prevent it, Benny hurries down the tower to the scene of her death. What he does next will forever alter the course of his life: He does nothing. He gathers up the drowned girl’s belongings and doesn’t tell a soul what he saw. 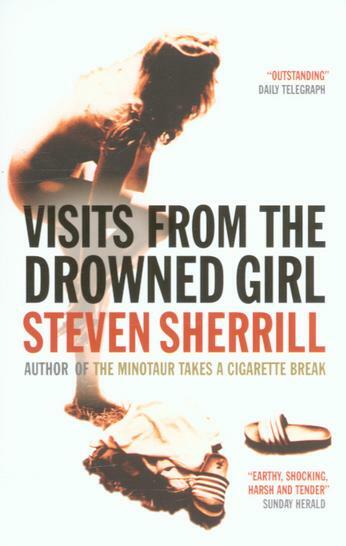 Instead, Benny visits the address on a business card he finds in the drowned girl’s bag and slowly insinuates himself into the life she once lived. But even as he immerses himself in her world, he wonders: What does it mean to watch someone die? And what can explain his strange attraction to the drowned girl? Through a labyrinth of rationalization and denial, Benny struggles to figure out who to tell and what to do, until it becomes not only impractical but truly impossible for him to ever reveal his secret, the burden of which soon becomes unbearable. Visits from the Drowned Girl is a tale about the seductive but ultimately pernicious nature of secrecy. We are all voyeurs, to one degree or another. The question is, at what point do we become responsible for the things we see?